Greetings! My name is Grace Mikelsons and I am currently a sophomore studying Environmental Science. This summer, I stayed in Des Moines and worked with Professor Peter Levi and fellow student researcher Katie Schulz in the Stream Ecosystem Ecology Lab, helping with the fieldwork and data analysis that Katie described in her last post. At the beginning of the summer, we three sat down and figured out what we wanted to accomplish over the course of the summer, roughly planning out when we were going to head into the field and when we would be back in the lab analyzing the data. Of course, everything would be contingent on the weather; we anticipated having to move a few things around because of a rainy day here or there that forced us inside, but nothing more. None of us could have anticipated what occurred at the end of June and how much it would affect our research. On the night of June 30th, Polk County experienced heavy rainfall that resulted in flooding throughout the county. In the few hours that it rained, we received enough precipitation to significantly raise the water levels in the Des Moines River and other waterways. I chose to stay home that night and watch the deluge from the safety of my house, but heard a lot of frightening stories from those who were on the road that night. From stranded cars to homes flooding to closed roads, hardly anyone could avoid being affected in some way by the flooding. Several buildings on Drake’s campus were impacted. 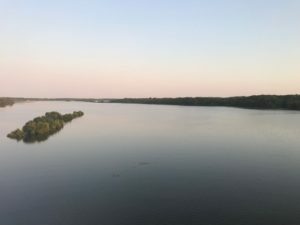 I took these pictures from atop the High Trestle Bridge that overlooks the Des Moines River. The first was taken on June 7th, 2018 and the second about a month later on July 6th (note the “island of trees on the left of each picture). Katie and I were astonished when we headed out to Chichaqua Bottoms Greenbelt for our first day of fieldwork after the floods. The larger ditches were so high that we could not safely enter them. In Bluff Creek, one of our smaller, wooded, sand-bottomed streams, the floodwaters ripped through it and formed a completely new stream channel that runs parallel to the original. 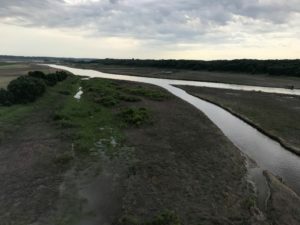 Just from the path of flattened grasses, piles of sediment, and strewn debris, we could see that the stream had breached its banks when it was at peak flow and had rushed into the adjacent cornfield. One of our sensors that we installed in the stream had become buried in sediment and had to be dug out. The water levels stayed high and kept us out of the ditches longer than we would have liked. This gave us time to focus on the smaller streams where we collected a lot of data that should allow us to tell a really interesting story about the effects of flooding on them. Over all, the experience taught me to be flexible and to be a problem-solver. In research, it is impossible to account for everything and you really have to be ready to adapt! We learned a lot this summer about working with unpredictable Iowan streams and will be even more prepared for whatever project comes next! Hello! My name is Katie Schulz, and I am a senior studying Environmental Science from Omaha, Nebraska. This summer, I had the opportunity to do stream ecosystem ecology research with Professor Peter Levi through the Drake University Science Collaborative Institute (DUSCI) Summer Fellowship, an eight-week program that funded our study of streams’ ecological response to land conservation. More specifically, we observed the physical, chemical, and biological differences between streams surrounded by varying degrees of agricultural and conservation land, and tried to identify which ecological ‘drivers’ where having the greatest impact on stream ecosystem health. We conducted our field work at six research sites within Polk County Conservation’s Chichaqua Bottoms Greenbelt, a ten-mile strip of sandy upland hill prairie filled with beautiful backwaters, marshes, and wetlands. Out in the field we conducted a variety of tests, most of which involved suiting up in waterproof waders and hopping in the stream to get deep down and personal with it. Through conducting tests like taking water and sediment samples, measuring the velocity and morphology of the stream, and analyzing oxygen curve data, we kept our research question in mind: what specifically about land conservation improves stream ecosystem health? Although our project continued beyond the eight-week period of DUSCI, my experience as a summer DUSCI fellow gave me a variety of resume-building experiences that I am excited to apply to my coursework and future career. Between writing my own grant proposal to giving a final research presentation, I now feel more comfortable in my abilities as a critical-thinker and researcher. My work in hydrology and stream ecosystem ecology has sparked my passion for work in water quality and land conservation, which I hope to apply to my post-graduate career. As rivers and streams provide countless ecosystem services, or benefits that human society receives from the natural environment, I firmly believe that water conservation efforts are important in ensuring that services like natural water filtration and flood mitigation remain intact. Though I’m now in the full-swing of my senior year, I will always look back on my summer DUSCI research with a smile. My name is Katie VanDooren and I am studying Environmental Science/Public Health at Drake University—class of 2019. This summer I have the privilege to immerse myself in a couple of Dr. Levi’s research projects. The majority of my summer will be spent collecting water samples along the North, Middle, and South Raccoon River and at their confluences. We are interested in learning about water chemistry of the suspended load in different regions of the Raccoon River watershed. Sediment will also be collected (with Dr. Levi’s fancy new Ponar) to perform denitrification assays as stream order increases and urbanizes. This summer we are also collaborating with Polk County Conservation to start a long-term water budget survey of Chichaqua Bottoms Greenbelt. Gain expertise in our research. I’m doing undergraduate research coming out of my first year of college—that is insane to me. I am so fortunate to be a part of meaningful science so early in my time here at Drake, an experience many state universities cannot offer to its undergrads. That being said, the work we are doing is complex and interdisciplinary, as the field of environmental science is. This “learn-as-you-go” style of teaching is yet another thing that excites me about this summer. Perfecting data collection technique in the field is every scientist’s ideal work day, and from my experience, it’s also the easy part. The challenge for me will be to combine background knowledge, conclusions drawn from our data, and implications to communicate the science to the people who are scientifically illiterate, but directly affected by the health of the Raccoon River. Get this research up and running. The research assistants (Thomas and myself) are in a really interesting position this summer. As Dr. Levi’s first year at Drake, I get to witness the birth of an entirely new research project. From grant proposals to redeveloping our research questions to ordering supplies, I’ve learned that dialing down our ambitions is the best way to ensure quality data to present next spring and so on. In practice, this looks like delaying a month’s worth of data collection and replacing it with 7 trips to Home Depot and even more online transactions. In a couple of weeks we’ll hit the ground running with our year-long denitrification assays and what a relief that will be! Grow. As a student discovering what areas of the environmental field intrigue me most. As a worker learning how important flexibility, precise note taking, and organization is (a.k.a. backing data up in 3 different places). As a person who can transfer the leadership skills gained from this experience into a multitude of situations. As a member of society communicating the science of healthy and impaired water systems to family, friends, and uninformed strangers that I come across. I’ll use this blog as a tool to update you all on what the team is up to, my scattered self-reflections, field adventures, and plenty of pictures! Happy Monday!